﻿ 4 Ways to Win With Your Holiday Email Campaigns » Red Mango Marketing! Take a walk through the aisles of your local pharmacy, and it’s clear that the holiday season is upon us. Snowmen, reindeer, and religious items are nuzzling their way into the shelf space currently occupied by skeletons, costumes, and giant bags of candy. Soon enough, the taps at our favorite watering holes will follow suit with a Winter Ale replacing the beloved Octoberfest brew. My friends, winter is coming, and with it, the promise of great potential sales. Of course, you probably have those dates marked on your calendar, but how can you truly get the most sales juice for the marketing squeeze? With that challenge in mind, we’ve come up with four helpful ways to win with your holiday email campaigns this season. 1. Review your holiday email campaigns from last year. If you’re not measuring, you’re not marketing. Take a look at your email campaigns from last year in Constant Contact’s robust reporting section. 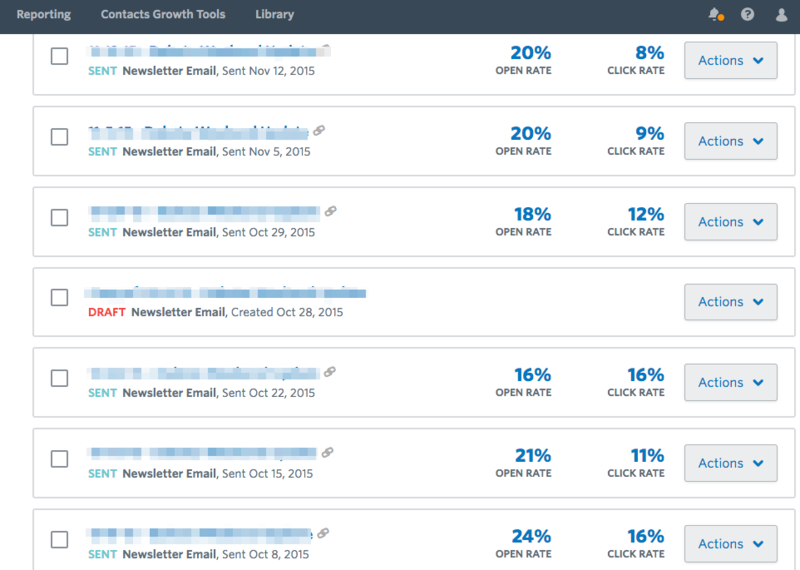 Which of my email campaigns generated the highest open and click-through rates? Was there anything special about the subject lines or content? On what days were my high-performing emails sent? Which of my email campaigns generated the lowest conversions? Were these campaigns sent on different days at different times? Is there room for improvement with subject lines or content? Did one targeted contact list perform better than another? Which campaigns generated the highest unsubscribe rates or SPAM complaints? Why do you think? When asking yourself these questions, I highly suggest you take a minute to contemplate each answer. Does anything stick out to you? What can you do better? These questions will help you to determine which email campaigns should be a mainstay in your 2016 holiday marketing program. 2. 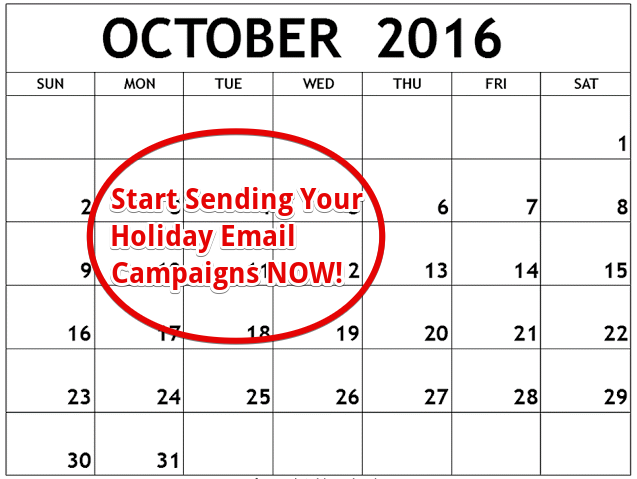 Start your holiday email campaigns early. According to the Experian report, retailers began their 2015 holiday campaigns 85 days before Christmas (October 1st.) That means they’re already firing off their holidays emails as this post is being written. If the big brands like Wal-Mart, Amazon, and Zappos are sending now, then us SMBs should follow suit. If you find you don’t have the time or staff to put these holiday email campaigns together, then consider Constant Contact’s Do It For Me Services. Experienced and vetted digital agencies like BJC Branding help hundreds of clients communicate with their prospects and customers every month. 3. Increase your holiday email campaign frequency. This is a case where “Monkey See, Monkey Do” makes total sense. During the holidays, we are competing for business from our local competitors, online shops, and the big brands. The vast majority of retailers will dramatically increase their send volume during the holidays in a bid to keep their products and services in front of impressionable consumers. Before you copy the same email campaign and schedule it for every day next week, please remember that quality is much more important that quantity. If you do not have the resources or time to craft unique email campaigns, then you are better off sending just the one. In fact, according to the Experian report, 90 percent of retail email campaigns included an offer. The three most used offers were (1) Free Shipping, (2) Sales or Percent-Off Deals, and (3) Coupons or Codes. 4. Measure and tweak your holiday email campaigns. If you think your job is done when you press the “Schedule” button, you are sadly mistaken. Keep a close eye on the results of your holiday email campaigns and see what is working in real-time. About 48 hours after each campaign send, ask yourself the same questions from above and see if you can tweak your upcoming campaigns to drive the most opens, clicks, and sales for your business. Now, it’s time to hunker down at your computer with a 5-pound bag of candy and your favorite Fall brew and start winning with your holiday email campaigns! If you’re in need of a little inspiration, take a look at these 30 Creative Holiday Email Ideas from other successful business owners. Then, log in to your Constant Contact account and choose the perfect holiday template for your business. Have questions? Feel free to write in the comments below or attend one of Constant Contact’s Marketing Seminars. About the author: Bryan Caplan of BJC Branding is a Master Certified Authorized Local Expert for Constant Contact. BJC Branding, based out of the Greater Boston area, provides educational workshops and marketing consulting services to a wide range of businesses. Learn more. 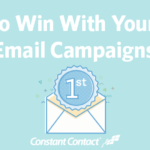 The post 4 Ways to Win With Your Holiday Email Campaigns appeared first on Constant Contact Blogs. This entry was posted on Tuesday, October 25th, 2016 at 8:00 am	and is filed under Email Marketing, News & Updates, Online Marketing. You can follow any responses to this entry through the RSS 2.0 feed. Both comments and pings are currently closed.